Hal Armstrong takes an in-depth look at the Present State of Snowmobiling: Where do we stand and where are we going? Technical Editor, Brad Harris writes on the Extinction of the 2up Touring Sled. Is it going the way of the Dodo? The Snow Goer Canada Technical Staff assesses the popularity of the Touring/Utility Crossover market. We bring you one man's custom-built ice fishing dream machine. Looking for a unique riding destination? Snow Goer Canada goes trekking in Finland. 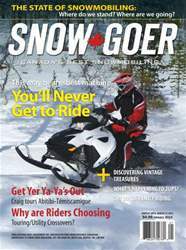 Craig Nicholson, the Intrepid Snowmobiler tours Quebec's Abitibi-Temiscamigue region. sleds he's found in the most unlikely places. 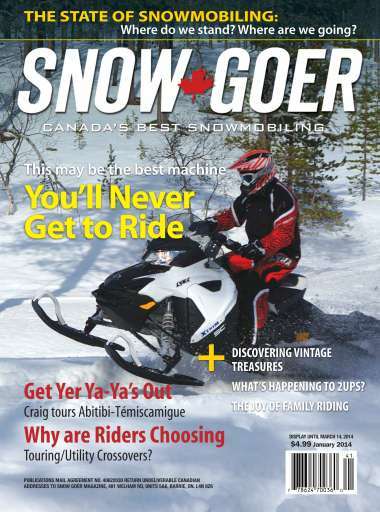 The Joy of Family Riding, and lots more in this issue of Snow Goer Canada.